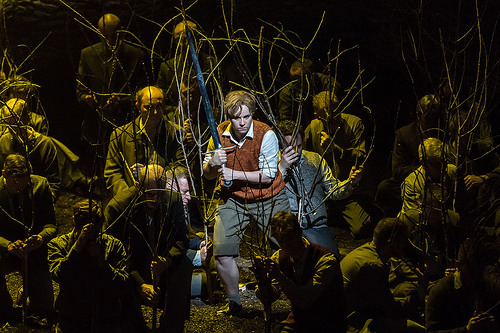 It is over 20 years since Rossini's Guillaume Tell was performed at Covent Garden and having heard Antonio Pappano perform the piece at the Proms with his Santa Cecilia forces, we were eagerly anticipating the new production. The reports from the first night were rather depressing, not just because of the controversy over the Act 3 ballet, but from the general lack of enthusiasm for this production of Rossini's grand opera. We went along to the matinee on Sunday 5 July 2015, the production's third outing with Gerald Finley as Guillaume Tell, Enkelejda Shkosa as Hedwige, Sofia Fomina as Jemmy, John Osborn as Arnold, Malin Bystrom as Mathilde, Eric Halfvarson as Melcthal, Samuel Dale Johnson as Leuthold, Michael Colvin as Rodolphe, Michael Lessiter as a Huntsman, Enea Scala as Ruodi, Alexander Vinogradov as Walter Furst and Nicolas Courjal as Gesler. The production was directed by Damiano Michieletto, with sets designed by Paolo Fantin, costumes by Carla Teti and lighting by Alessandro Carletti. Antonio Pappano conducted. The basic set consisted of white walls with a dark brown earth floor. The 'earth' moved and was granular so that people could grasp handfuls of it and dig into it, evidently it was made of grains of rubber. For Acts Two to Four a huge uprooted tree formed the main focus of the action, and there was a revolve which was used extensively. The floor surface was disturbing on two counts. First, it seemed to absorb sound a bit and some of the voices suffered somewhat. Secondly, it entirely prevented dancing which was worrying in a production of the grandest of French grand opera. This genre involved the synthesis of visual splendour, grand historical sweep, dance, choral and solo singing into a whole which was articulated by a story of personal tragedy set against historical circumstance. To this, Rossini brought an element of dramatic thrust and an Italian feel for melody, but the work is built on a generous almost ponderous scale and the plot takes a long time to develop. Act One lasts around 80 minutes when uncut and we only get a little plot at the very end. 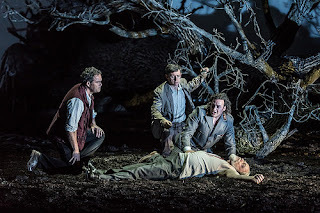 It is possible to find within the opera a tauter, more dramatic and more Italian opera and Welsh National Opera's production last year used a trimmed edition which brought this out. But Covent Garden was using the shortest of Rossini's sanctioned four-act French versions and many people had hoped they might go for something even more generous. Lamberto Gardelli's classic recording and the recent Naxos recording from the Rossini in Wildbad Festival have shown that the fullest of versions of this opera have a very real dramatic validity, provided you understand French grand opera. But it was clear from the very opening, that Damiano Michieletto had no interest whatsoever in French grand opera. His entire production concept was based around the drama arising from the struggle between Swiss and Austrians (here relocated to the Balkans). The opening act, which is intended to give us a sense of the Swiss nationhood from which the action springs, was re-focussed away from community to the personal. We were presented with cowed villagers, no dancing, no wedding, no celebrating, and Damiano Michieletto had invented extra action to fill in the time. Arnold (John Osborn) looking at his cache of letters from Mathilde (Malin Bystrom), and having them discovered by his father Melcthal (Eric Halfvarson). 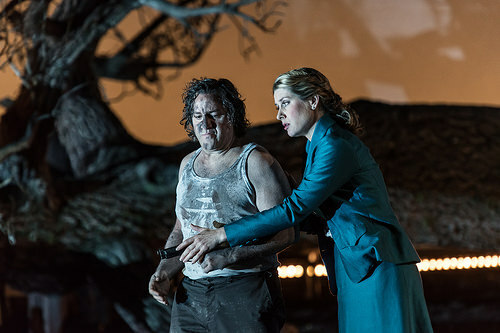 Family problems between Willliam Tell (Gerald Finley) and his son Jemmy (Sofia Fomina), in fact rather than being a generous pater-familias this William Tell was an angry grump. One invented idea which was constant through the opera was Jemmy and his game of soldiers, inspired by a comic book account of the 15th century William Tell. The character of William Tell comes to life and appears to Jemmy at key moments in the action, whilst Jemmy and his soldiers were present in many scenes which do not include the character in the opera. Such ubiquity was wearing, but it was an example of the way Damiano Michieletto constantly told us what to think. During the Act Two encounter between Arnold (John Osborn), William Tell and Walter Furst (Alexander Vinogradov), as they tell Arnold about the death of this father his ghost appears to Arnold, who spends a lot of the remainder of the scene apparently trying to dig the corpse's grave. During William Tell's solo Sois immobile, because Tell refers to his wife, we see her clanking plates onto a table and emoting. The production was full of such details; so much so, that some of the later scenes became complex, multi-layered visual messes. In fact, many of the visual images from the production were, ultimately, banal. Arnold staggering about under the weight of a huge pile of arms in Act 4 after singing Asile hereditaire in and on his bed. The women tottering about the friable earth in high heeled shoes. Arnold and Mathilde sitting on a 1950's style three piece suite in the middle of the earth next to the overturned tree. Many of the images were no doubt arising from complex thought processes but the results were not visually stimulating. For the great storm scene in Act 4, we had a giant, out of focus projection of Jemmy's comic book and a fight between Gerald Finley and the historical William Tell figure staged so it was almost invisible from the Amphitheatre. I think the biggest miscalculation was in the great oath scene at the end of Act Two. Here Rossini write for three, separately characterised, choruses representing the three cantons. 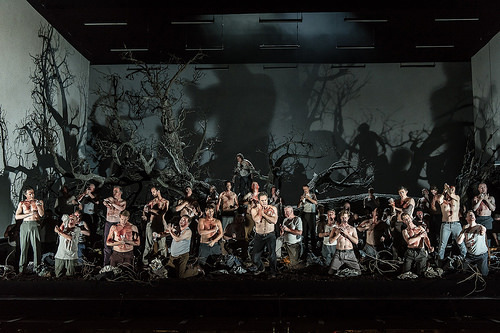 The Royal Opera Chorus fielded a huge number of men (around 40 extra male chorus members) but instead of making an entrance in three groups they were put on the revolve, in the dark and then revolved gradually into view and sang the choruses stationary, all in a single body, before coming to life for the oath. We were given no sense of the detailed characterisation of the groups which Rossini provides, and no sense of community coming together. The whole production was bathed in violence, no light-hearted dancing in Act One, no hunt in Act Two (the men were breaking from manoeuvres, or hunting peasants), so it is not surprising that the Act Three ballet was nasty and brutish. The big surprise was that the ballet sequences hadn't been cut completely, Damiano Michieletto seemed to have no interest in the sort of drama to which a ballet might be relevant. grand opera, and few from the era are staged. The idea of entertaining with grand historical spectacle, a visual feast, dancing and such is anathema to many opera companies and in fact many of the theatrical values shown by the genre are evinced in the musical theatre nowadays. Perhaps we purists should be content with concert performances. Clearly Antonio Pappano and the cast, in some way, bought into Damiano Michieletto's production which only helped prove my view that the present regime at the opera house has no interest in doing French grand opera properly, which is a great shame. The tragedy was that this banal staging was allied to some very fine performances indeed, and that Damiano Michieletto had clearly inspired his cast. 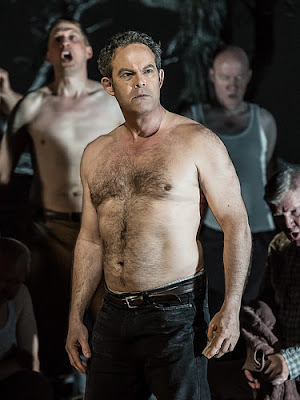 Gerald Finley sang with a noble sense of line, though his character spent much of the opera angry. John Osborn cut a very shabby, depressing figure as Arnold but his voice contradicted this and we had a wonderfully virile account of Arnold's music and the great Act Four scene seemed to find John Osborn tireless. Sofia Fomina was convincing and personable as Jemmy, singing ideally and conveying all the extra which Damiano Michieletto wanted. Enkelejda Shkosa looked good as Hedwige though her mezzo was rather to richly fruity for my taste in this role. To complain that Malin Bystrom was not Montserrat Caballe is pointless, clearly Antonio Pappano has no interest in a Caballe style voice in this role. Instead Malin Bystrom was anxious and fragile, with a voice richly expressive in its use of vibrato but still well able to encompass the role's high tessitura and florid passages. And in Act Three, finally she did evince a surprising degree of backbone. Nicolas Courjal was so camply vicious that it was almost funny, certainly he was encouraged to be completely over the top. I have seen far more threatening, grimmer Geslers who achieved this by doing less. But we had to recognise that Damiano Michieletto does not understand that less is more, particularly in an opera with around 200 minutes of music. Chorus and orchestra were both in great form, and if you listen to this on the radio then it will sound superb. Quite what the viewers in the cinema will think when getting a close up of some of the more violent scenes. I have not disliked a production so much for a long time, and the rating of three stars simply reflects the fine musical performances from the cast and the fact that working within the confines of Damiano Michieletto's production, they all gave superb performances. Robert: thank you for this detailed review, which I happen to fully agree with. Damiano Michieletto and his team seem to have tried to bite off much more than they can chew. This view seems to be shared in quite a few comments that were left on the ROH website, although, to be fair, there is also a number of people who seem to have liked what they saw - certainly there were several tweets to this effect after the screening on Sunday. Quite possibly, the production looks a bit better on a cinema screen - was this perhaps the director's intention all along? Once again, thank you for sharing your view - I am glad to find myself in such good company.